We have had a psycho squirrel living in our maple tree since late last spring. I am not sure if he's truly crazy--or just clumsy--but, he does some odd things. He has fallen out of the tree a few times (once inches from my head), he taunts the cats outside the front window, and he frequently peeks into my office window from atop the rose trellis--thoroughly scaring us both to death....I scream, he jumps...same scenario...different days. 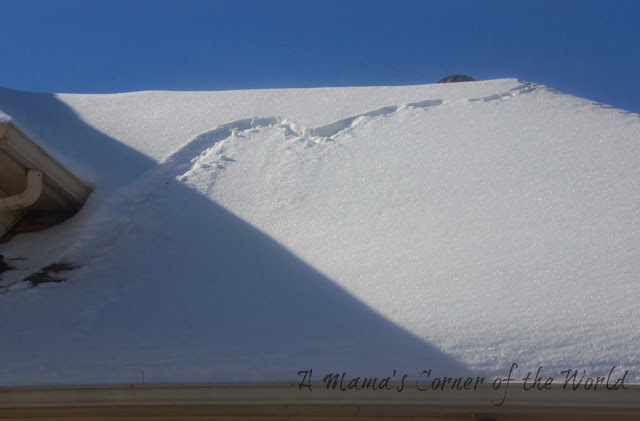 We have had a bit of snow again--and, I thought I'd share my latest hmmmm-inspired photo as this week's Wordless Wednesday Link-Up. While I didn't see Squirrel Nutcase create this Squirrel Sized Ski Jump--I'm pretty sure he did it. It's his usual M.O.--and path from the back deck to the front tree. I am sure he probably made it safely from the end of the "ski slope" to his happy home in the tree. I do think I can make a valid case for his insanity; however, if I see a new jump trail today. After the frog in the fireplace, nothing really surprises me anymore--but, things do kind of make me shake my head and smile! Enjoy your Wednesday--and don't forget to link up your latest, favorite Wordless Wednesday posts! Ok, that is pretty funny. 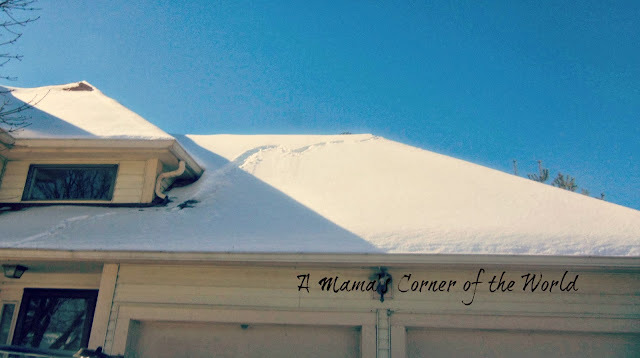 Good thing he didn't keep going & slide right off the roof! I missed the frog in the fireplace story. :) Sounds like there is never a dull moment over there. I say send the squirrel to the winter Olympics with instructions to bring home the gold! That is rather funny! Great spotting. Lol, that's awesome!!! Happy W.W.
That is so funny, I know from experience that they are very persistent but as for clumsy humm, he may have some issues LOL.. He's probably hanging out in your house rent free. LOL that is too funny! Happy wordless and thanks for hosting! Squirrel Nutcase. Love it! He really would make a great character for a Beatrix Potter story. that is hilarious! that squirrel is Nuts! ba-ding. LOL Squirrels can be so crazy! He's training for the Squirrel Olympics! Yep, squirrels are crazy...just ask my mechanic (they've taken a liking to my SUV for two years running). He's ready for the Squirrel Olympics! haha. That is too funny! Good spot! Funny! We just got snow dumped on us last night. I still love your template! Have a wonderful day. Lol! That's an entertaining story, and quite a capture of his little adventure. LOL LOL LOL . . Too funny! The image I have in my head of a squirrel going down that is making me laugh hard, lol. Wow - I think that's pretty cool! This is really just too funny. Can you just imagine seeing your squirrelly squirrel on its make-shift roof top slop with a pair of nutshells strap to its feet and tiny twinge for poles? There could be a cute children's story in this. Thanks for stopping by & joining my WW linky party! That's a pretty funny story. Has he ever scared you? You must try and capture this little rascal on camera! LOL! That squirrel is funny! We have some squirrels but they're very good in climbing and jumping from one tree to another tree.